Today I had the pleasure of meeting the adorable kids in my Awesome Author class! It meets on Saturday for two hours every month, for five months. Every class I focus on a different author and/or illustrator. For the first week, we learned all about Kevin Henkes (one of my all-time favorites). I went to the library and took out one of every picture book that they had written by Kevin Henkes. I specify picture book because he wrote chapter books as well. I probably had about twelve books. We ended up reading “Wemberly Worried” and “Lilly’s Purple Plastic Purse”. We also looked through “One Day” and “Owen”. 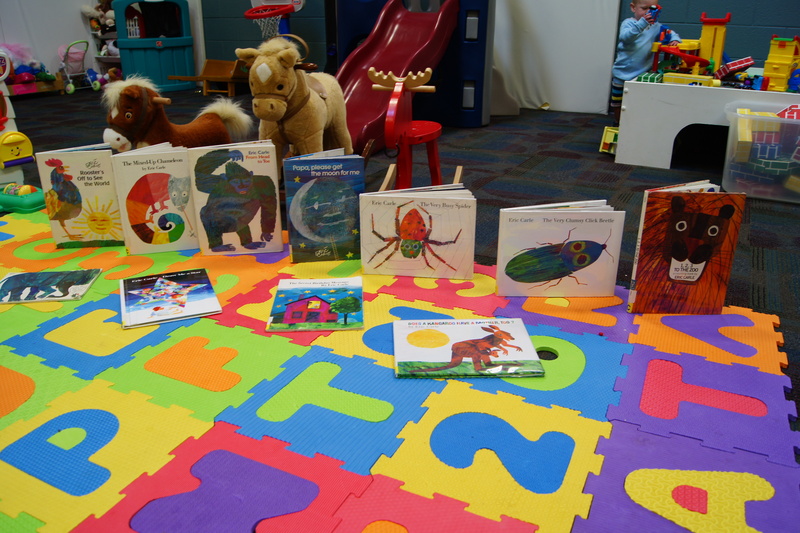 The other books were available for the children to look through and for parents to note for future library or bookstore trips. 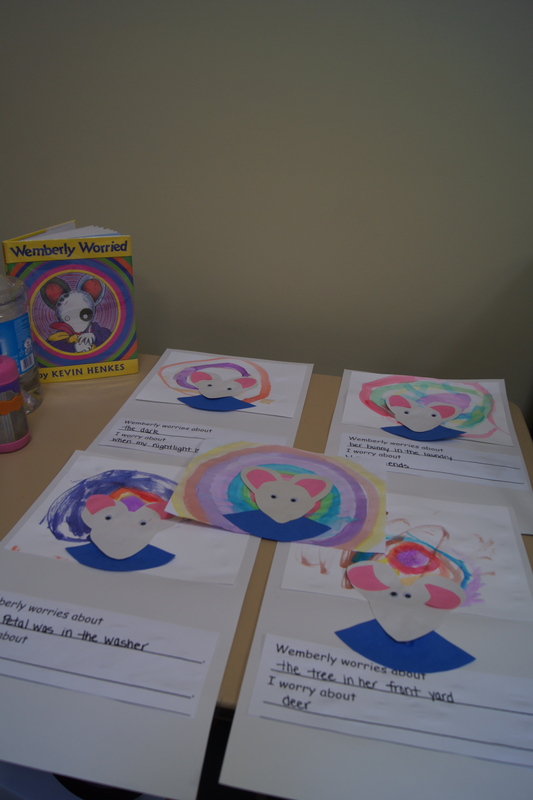 During our first circle time, I read “Wemberly Worried”. The kids really liked it. We stopped several times and talked about all of the different things that made Wemberly worry. We talked about how she cuddles with her stuffed rabbit, Petal, to feel better. I tried to encourage the kids to make text-to-self connections. We talked about different strategies that they try when they are feeling worried. Many mentioned that they had stuffed animals of their own that they snuggled with when they were feeling upset. We also talked about what made them worry (most had issues with being in the dark). I made an enlarged picture of Wemberly and hung it on the easel. When we were finished with our conversation, I had the kids take turns sharing something they learned about the main character, Wemberly. As the kids were sharing, I wrote their ideas on a sticky note and they stuck it up on the picture. 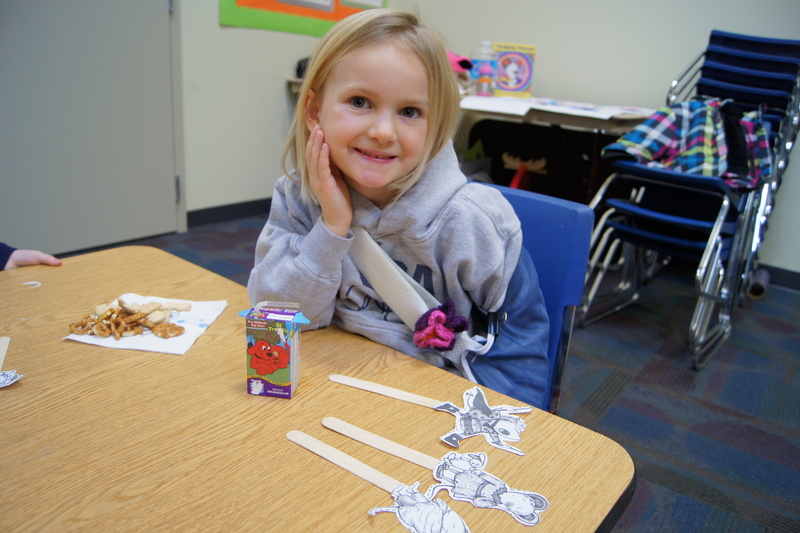 This showed the children’s words in print, that they were describing the main character of the story, and reinforced active participation in learning. These are all strategies that are used in Kindergarten. I am finding that I get really into my classes and cannot seem to remember to take pictures of everything!! It is very frustrating! Unfortunately, I didn’t get a picture of Wemberly with the sticky notes on it, but the kids came up with great details from the story. Next, we studied the cover of “Wemberly Worried”. I got this idea from this website. This blog has a ton of great ideas and all of the templates for this cute craft. We took watercolors and created circles with different colors until the page was filled, pretty much. After the paint dried, the kids glued the different pieces of Wemberly onto their painting to create the cover. Next, we attached it to a large paper. At the bottom, I asked them to think back and share something that worried Wemberly and then something that worries them. Some of the children wanted to look back through the book, which was a great strategy for remembering. Here is the end result…. 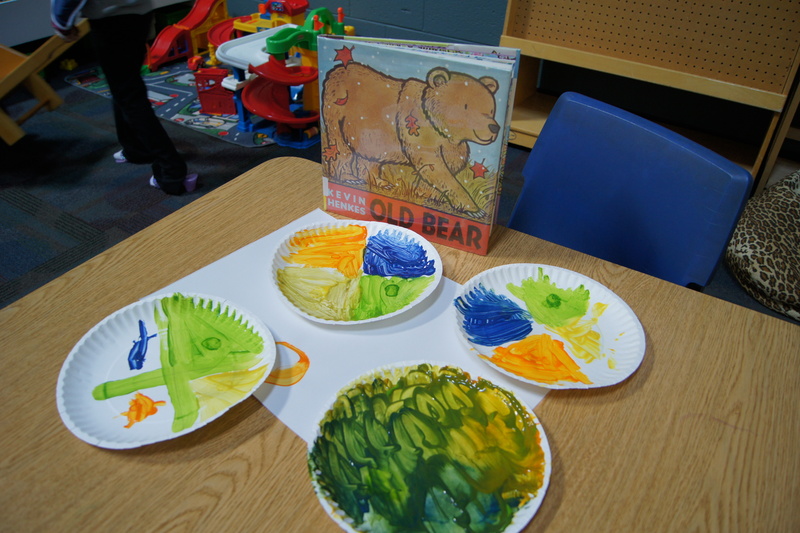 The second craft that we did was a modified version of this, based on “Old Bear”. I changed a few of the icons and the paint colors. We divided a paper plate into four sections and then painted them. Then we came back after the paint dried to glue on the pictures and construct the bear spinner. One note, the paint took FOREVER to dry and I ended up having to extend class a few minutes to finish this one. If I had more time, we would have played with the spinner a bit and talked about the different seasons a bit more. We cut out different characters (Wemberly, Lilly, and Owen) from here. 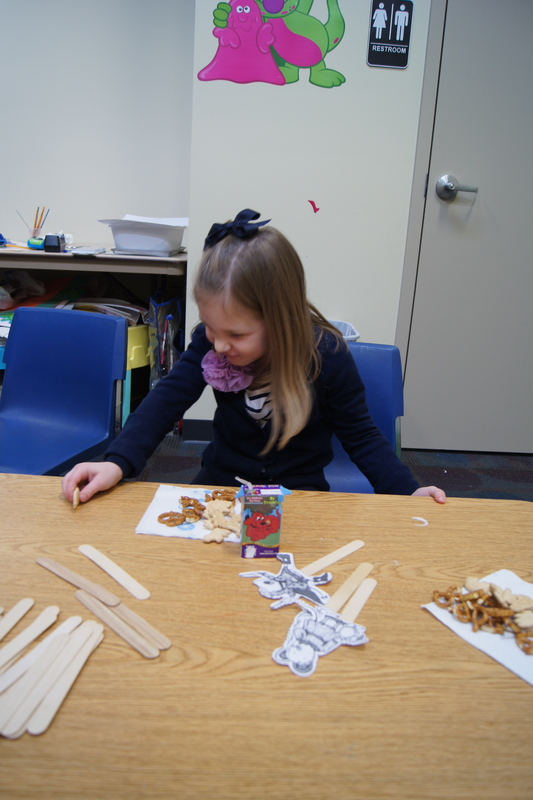 We glued them to popsicle sticks to make puppets. 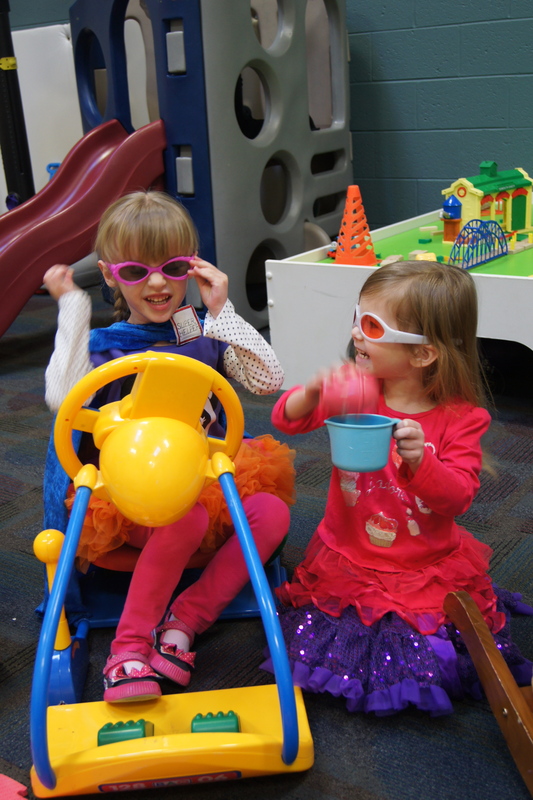 As the kids were enjoying their snacks and playing with their puppets, I read “Lilly’s Purple Plastic Purse”. Overall, this was a really fun class!! Seriously, I was bummed when it ended. In addition, we covered so many concepts taught in Kindergarten! I can’t wait for our next class! 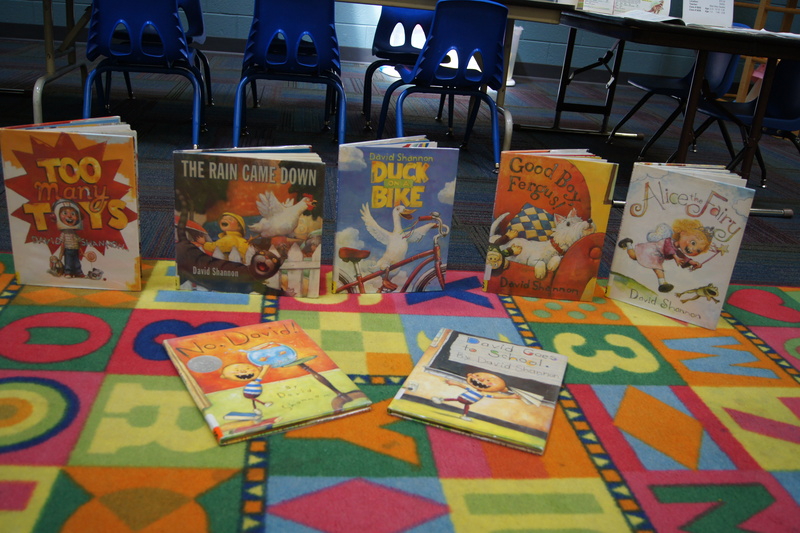 I was surprised by how many other topics and concepts we were able to touch on with these books. For example, Henkes uses great word choice. He is able to choose vocabulary that may not be familiar to kids this age in a way that they can understand. In “Lilly’s Purple Plastic Purse”, Lilly gets angry and then she gets furious. I asked if anyone knew what furious meant and no one did. 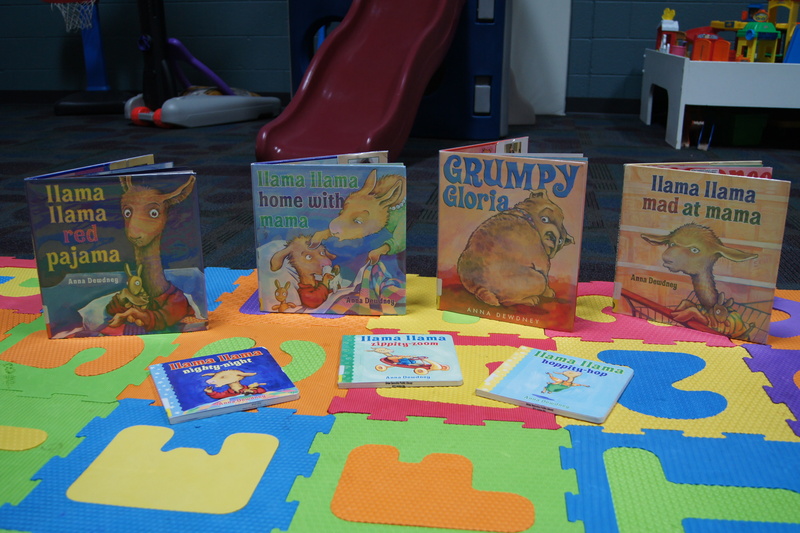 By looking at the pictures and thinking about the story, the kids were easily able to figure out that furious was feeling angrier than angry.